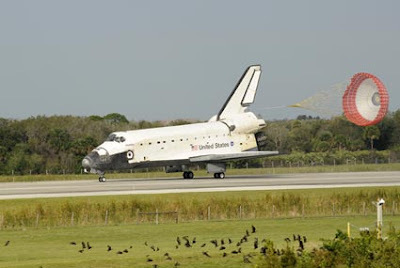 Space Shuttle Atlantis landed safely at NASA's Kennedy Space Center today, after a two week stay in space. Atlantis' STS-122 mission was to put the ESA's Columbus space station module into orbit and dock it with the International Space Station. According to NASA, the mission went "very well". Among the astronauts of STS-122 were Commander Steve Frick, Pilot Alan Poindexter, Mission Specialists Leland Melvin, Rex Walheim, Stanley Love, Dan Tani and ESA astronaut Hans Schlegel. Space Shuttle Atlantis after touchdown. Image courtesy of NASA/Bill Ingalls. "The station missions now are so busy ... It's been a tremendous experience. We were very excited and pleased to bring Columbus to the International Space Station." Here is a video of STS-122's final approach and landing at NASA's Kennedy Space Center, viewed both from the ground and from Atlantis. Hot on the trail of Atlantis is Space Shuttle Endeavor, which is scheduled for launch March 11th. Atlantis will return to its hangar to get ready for its August mission to the Hubble Space Telescope. Regards with regards to content this unique piece of writing! Lengthy ago I ran across any cyberspace web page ideal for your requirements. It includes tremendous it goes without mention good elements. At this time follow here Cash Advance Maintain ones wonderful succeed.